While tropical living may be a dream life for some, owning a home in tropical areas requires plenty of preparation and knowledge. Windows are one of the most vulnerable areas of the home, and require special attention to withstand tropical storms and moisture. Tropical states like Hawaii or parts of Florida, as well as U.S. territories in the Caribbean, experience a lot of moisture from frequent rain and humidity. These regions also endure tropical storms, such as hurricanes. Each year, the Hawaiian islands typically experience two to three Kona storms, which are a type of seasonal cyclone that can bring about heavy rains, flash floods, hailstorms, and high winds. Read on to find out about what kinds of windows work best in tropical climates. Because tropical areas endure hurricanes and other tropical storms, and can have as much as 60 inches of rain each year, exterior storm windows are crucial. Exterior storm windows can give you a peace of mind when a hurricane blows through and lower your energy bills by keeping your home cooler. In Florida, aluminum storm windows are common, because this material is lightweight, strong, and energy efficient. Aluminum storm windows are very weather resistant. Aluminum storm windows require little maintenance and are highly moisture-resistant, so will not warp or rot. For windows in tropical homes, it's better to avoid wooden window frames, as this material can easily rot and warp in a tropical climate's moist environment. Although it's expensive, fiberglass can be made to mimic wood and can withstand heavy rains and humidity. For the homeowner on a budget, although it's appearance is slightly less elegant than wood or fiberglass frames, vinyl is also a good choice for tropical climates. It's both extremely durable and energy efficient, as well as less expensive. Aluminum can also be a good choice for tropical climates, as it is strong and will not rot or warp in the humid weather. This material's strength makes aluminum storm windows excellent choices for extra window protection. Look for aluminum window frames with thermal breaks, which prevent the frame from conducting as much heat or cold and reduce condensation. Living in tropical climates is all about maintaining a cool, energy efficient interior in the tropical heat. Low-e coatings, such as spectrally selective coatings, can provide lower solar heat gain, while preserving your home's beautiful views and still allowing in the tropical light. For an even shadier, cooler home, you may want to consider designing your rooms so that your windows face north. North-facing windows will keep your home shadier and cooler than south, west, or east-facing windows, which tends to increase your windows' solar heat gain. Interior window treatments, such as the elegant bamboo shades, or other kinds of shades and lightweight curtains, are also good ways to keep your home cool and shady. While the tropics are a beautiful place to live, the wear and tear brought to the home can often be a challenge. However, with correct planning, you can easily keep your home airtight and protected. 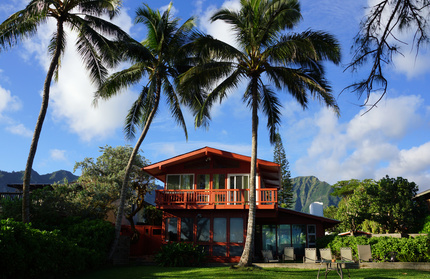 Additions such as aluminum storm windows and low-e glazing can go a long way in a tropical home.